Soviet Ambassador Ivan Maisky was a “Bollinger Bolshevik” who mixed support for Communism with a love of Western luxury. He was friendly to Churchill, whose views he recorded in his diary for October 1939. 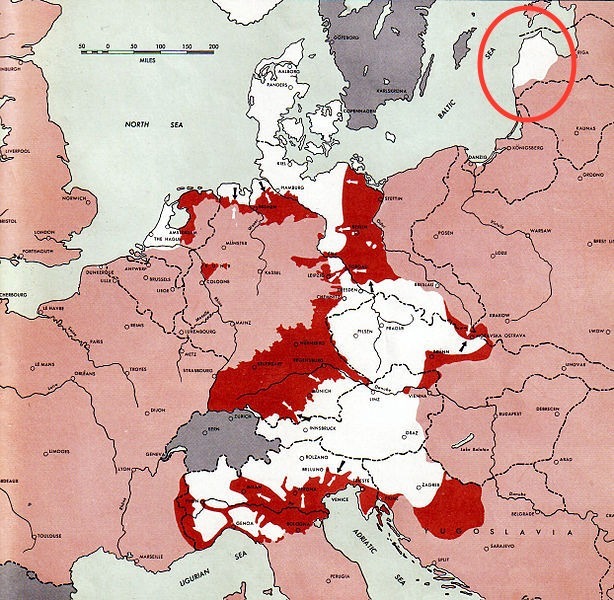 Churchill, wrote Maisky, expressed willingness to let Stalin have the Baltic States. (This was eight months before the Russians actually occupied those countries.) They were better off in the Soviet sphere than the German.59 There is no confirmation of this, except the context. Britain had just declared war on Germany, and Churchill was as anxious to separate Hitler and Stalin. Characteristically, Maisky tended to see what he wished to see. In December he recorded: “The British Government announces its readiness to recognize ‘de facto’ the changes in the Baltics so as to settle ‘de jure’ the whole issue later, probably after the war.”60 There was no such announcement. This must have been said very privately. When Germany invaded the Soviet Union on 22 June 1941, Churchill broadcast: “the Russian danger is therefore our danger.”61 Many Britons now renewed the demand to recognize Soviet occupation of Latvia, Lithuania and Estonia. It came now, not only from soft-liners like Cripps and Halifax, but from close Churchill associates like Eden and Beaverbrook.62 Stalin was adamant on the point. But de jure recognition was one thing Stalin would never get get. Harry Hopkins, Roosevelt’s emissary, visiting Churchill in the summer of 1941, suggested that the Russians were more interested in future borders and influence than military aid.63 But Churchill would agree only to a mutual assistance pact and a promise that neither ally would make a separate peace with Germany. He even promoted an agreement “that territorial frontiers would be settled in accordance with the wishes of the people who live there,” who would “be free to choose their own form of government.”64 Such a statement was struck by the War Cabinet on the grounds that it might complicate future relations. It is significant that Churchill drafted this over a month before the Atlantic Charter—which promised the same thing. British counsels were divided. Canada, New Zealand and South Africa were against recognition. Beaverbrook was adamantly for it: “The Baltic States are the Ireland of Russia,” he wrote. “Their strategic control by Moscow is as essential to the Russians as the possession of the Irish bases would be valuable to us.”72 This was curious analogy, since Churchill had refused to occupy Irish ports, which remained Irish throughout the war. In another thrust, Beaverbrook asked: “How can it be argued now that territory occupied then by the Russians—Lithuania, Latvia and Estonia—is not the native soil of the Russians?”73 Lithuanians, Latvians and Estonians could offer some arguments. Churchill’s suspicions were correct. Latvia’s President Karlis Ulmanis had been arrested and deported; he died in 1942. Konstantin Päts of Estonia spent years in prisons or “psychiatric hospitals,” finally dying in 1956. Lithuania’s Antanas Smetona, the first Baltic president to institute an authoritarian regime in 1926, fled, ultimately to the USA, where he died in 1944. From June 1940, politicians, teachers and intelligentsia—any who seemed a threat to the Soviet occupation—were deported en masse. Churchill was a politician depending on the support of a majority, and no politician could remain blind to that reality. Any pronouncement on the Baltic, he added, “might have disastrous effects in the United States in the election year, and there is no doubt that we should ourselves be subject to embarrassing attack in the House of Commons if we decided the fate of these countries.”85 But in judging Churchill, we are obliged to consider his complete record. And for him, the subject wasn’t closed. Churchill knew he was caught in a shocking compromise of proclaimed principle. What were they to say to Parliament and the nation, he asked Eden, about the idealistic principles declared in the Atlantic Charter? As the Red Army swarmed west in 1944, surviving Balts had the unpalatable choice of siding with one barbarian or the other. More fought with the Germans than the Russians. Often they buried their dead with crosses underground, to prevent desecration by the communists. When Riga fell on 13 October 1944, guerilla remnants retreated to Courland, northeastern Latvia. Here these formidable soldiers fought Stalin to a standstill. Stalin expended half a million men vainly trying to storm the “Courland Pocket,” declaring that the imperialist West would try to prevent reestablishment of Soviet authority. So too thought Hitler, who three times refused to evacuate Courland in 1945.91 But the West had no such intentions. Balts found themselves confronted by tanks bearing American white stars: Shermans supplied by America, thrown into battle before their new red stars could be painted on. They gave up only with the German surrender. In the end, the United States, along with Britain, Australia, Canada and a few other countries never recognized the Soviet incorporation of Estonia, Latvia and Lithuania. 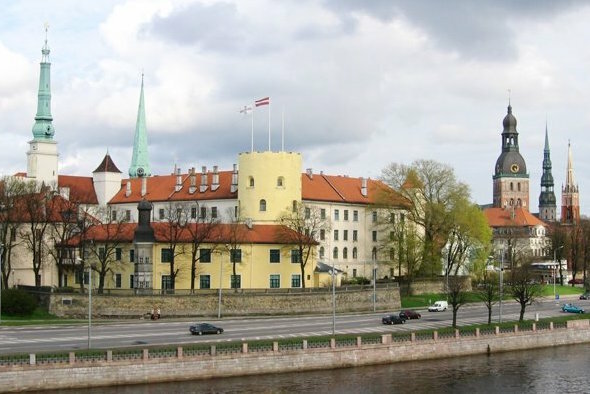 Baltic gold was safeguarded in London, and their embassies continued to function. Balts fortunate enough to escape, and their children, have long memories. They did not look kindly on Roosevelt, nor, one has to say, on Churchill. In hindsight, the fate of the Baltic States was sealed in 1939 when Britain’s weak overtures to Russia failed. An Anglo-Soviet understanding might have forestalled the Molotov-Ribbentrop pact. But such a difficult diplomatic task was beyond Neville Chamberlain, who rejected cooperation with Moscow. 59 Gabriel Gorodetsky, ed., The Maisky Diaries: Red Ambassador to the Court of St James’s, 1932-1943 (New Haven: Yale University Press, 2015), entry for 6 October 1939, 232. 61 Churchill, “The German Invasion of Russia,” broadcast, London 22 June 1941, in Robert Rhodes James, ed., Winston S. Churchill: His Complete Speeches 1897-1963, 8 vols. (New York: Borkwer, 1974), VI 6431. 62 A.J.P. Taylor, Beaverbrook (New York: Simon & Schuster, 1972), 474-76. 63 Robert Sherwood, Roosevelt and Hopkins (New York: Harper 1948), 309-10. 64 Churchill to Eden, 9 July 1941, Foreign Office Papers N3607/3/78. 65 Cabinet Papers WM 67/41, in Llewellyn Woodward, British Foreign Policy in the Second World War, 5 vols. (London: HMSO, 1971) II 12-13. 66 Elisabeth Barker, Churchill and Eden at War (New York: St. Martin’s, 1979), 233-35. 67 Winston S. Churchill, The Grand Alliance (London: Cassell, 1950), 613-16. 68 David Kirby, “Morality or Expediency: The Baltic Question in British-Soviet Relations 1941-1942,” in World War II and the Baltic States (State College, Pa.: Pennsylvania State University Press, 1978), 163. 69 Anthony Eden, The Eden Memoirs: The Reckoning (Boston: Houghton Mifflin, 1965), 320-21. 70 Cabinet Papers, WM 17(42), CAB 65/29. 71 Kirby, “Morality or Expediency,” 165. 72 Beaverbrook to Churchill, 7 February 1942, in Taylor, Beaverbrook, 510. 73 Beaverbrook to War Cabinet 26 February 1942, ibid., 511. 74 Winston S. Churchill, The Hinge of Fate (London: Cassell, 1951), 293. 75 Gorodotsky, Maisky Diaries, entries for 10 and 16 March 1942, 415, 418. 76 Ernest Llewelyn Woodward, British Foreign Policy in the Second World War, vol. IV (London: HMSO, 1975), 85. 77 Averell Harriman & Elie Abel, Special Envoy to Churchill and Stalin 1941-1946 (New York: Random House, 1975), 136. 78 Martin Gilbert, Winston S. Churchill, vol. 7, Road to Victory 1941-1945 (Hillsdale, Mich.: Hillsdale College Press, 2013), 12. 79 Entry for 7 May 1942 in David Dilks, ed., The Diaries of Sir Alexander Cadogan OM 1938-1945 (London: Cassell, 1971), 450-51. 80 Arnolds Spekke, History of Latvia: An Outline (Stockholm: Goppers, 1957), 402. 81 Priit J. Vesilind, “Return to Estonia,” National Geographic, April 1980. 82 John Grigg. 1943: The War That Never Was (New York: Hill & Wang, 1980), 180. 83 Kirby, “Morality or Expediency,” 158. 84 Churchill to Eden, 16 January 1944, in The Churchill Documents, vol. 19, Fateful Questions, September 1943-April 1944 (Hillsdale, Mich.: Hillsdale College Press, 2017), 1423. 86 Confidential Annex, War Cabinet meeting, 25 January 1944, in Churchill Documents, vol. 19, 1505. 87 Eden to Churchill, 25 January 1944, ibid., 1497-98. 88 Churchill to Anthony Eden, 31 March 1944, ibid., 2251. 89 WSC to AE, 1 April 1944, ibid., 2266. 90 WSC to AE, 31 March 1944, ibid., 2252. 91 Visvaldis Mangulis, Latvia in the Wars of the 20th Century (Princeton, N.J.: Cognition Books, 1983, 136. 92 Churchill, Grand Alliance, 615. 93 Premier Papers 3 394/5, in Barker, Churchill and Eden at War, 235-36. 94 Mayor Teodors Eniņš to the author, Liepaja, Latvia, 10 May 1995. Richard Langworth visited the Baltic after liberation in 1992 and again in 1995, when he bicycled the Latvian coast from Lithuania to Estonia, and presented a Latvian translation of Churchill’s The Dream to then-President Guntis Ulmanis. This is an updated version of articles in Finest Hour (1986-87) and in National Review (1990), with new entries based on The Churchill Documents, Vol. 13-19 (Hillsdale College Press, 2009-2017) and the Maisky Diaries (2015). This essay is dedicated to the memory of those Latvians, Estonians and Lithuanians whose unmarked graves are scattered from Dresden to Kolyma, and to the memory of Max Edward Hertwig, 1886-1970.